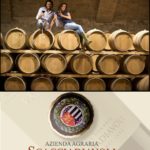 THE SCACCIADIAVOLI WINE ESTATE Is one of the most ancient wine production estates of the “Montefalco” zone. The name Scacciadiavoli (Devil banisher), derives from an exorcism carried out here in the XVII century, as described by Johannes de Rupescissa in a treatise on quintessence. The episode involved a young woman possessed by the devil, who was made to drink some of the local red wine by the exorcist, which succeeded in driving away the devils. The hamlet has been named after this historic event and is today called “Scacciadiavoli” In the mid XIX century, Prince Ugo Boncompagni commissioned the building of wine production cellars which are still in efficient working order today, and due to the large size of these cellars it took the name of “Localita Cantinone” (Large cellar area). In the mid 20th century, the grandfather of the current owners, Amilcare Pambuffetti, purchased the estate, which extends over a surface area of 130 ha, 20 ha of which given over to grapes. The estate produces the typical types: Montefalco Sagrantino 11 ha, Montefalco Rosso 5 ha, Grechetto 3 ha. An architectural and functional renovation project is currently underway of the “Cantinone” premises, involving both the reconversion and expansion of the vine growing area, aimed at improving the quality standards of the production of the “Montefalco Sagrantino” and the “Montefalco Rosso” varieties. 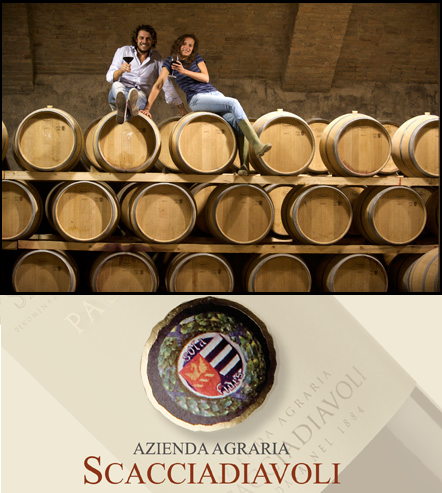 The Pambuffetti brothers are optimistic that thanks to the potential of the land and the micro-climatic conditions, the Scacciadiavoli Estate, is sure to reach its objectives, with the collaboration of highly experiences agronomists and oenologists also. This optimism and conviction is also aptly expressed in the motto “Sola Fides” embossed on the coat of arms, positioned at the front of the cellars.